This entry was posted on August 13, 2009 at 8:45 pm	and is filed under p38, Pfizer. You can follow any responses to this entry through the RSS 2.0 feed. You can skip to the end and leave a response. Pinging is currently not allowed. It’s alive! And the sole inventor on this patent is one Kenneth John Butcher – but he probably did not design it. Looks like a handywork of some small startup company that started with fragment-based design and then progressed to old-fashioned BIRB-series patent busting. Saw a Pfizer talk earlier this year about some very similar compounds….it was for p38 in the lungs & so the compounds were designed to be inhaled, have low systemic exposure, meaning they were damn ugly and broke Lipinski’s Law (which is sacrilege in Pfizer!!) This looks like another one…..
Am surprised this molecule got as far as it did, looks to be lots of metabolic liabilities in it does there not? Vile Donkey – where was that Pfizer talk>? 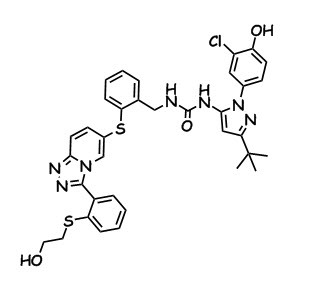 Ah found it, Anglo Swedish Med Chem 2009 example PF-994888 has the basic scaffold, just different aryl and fused azole substituents. An example of Cut-Paste chemistry to make hybrid p-38 inhibitor! i love this frankenmolecule! it got it all except a non-standard element. Couldn’t the put a Boron in there somewhere?